Supervisor Edward R. Wehrheim previously represented the residents of the Town of Smithtown as a member of the Smithtown Town Board. He was first elected to the position of Town Council in 2003. His commitment to serving constituents in the Smithtown Community is one of Supervisor Wehrheim’s most popular assets. Previously as a member of the Smithtown Town Board, Supervisor Wehrheim had continued his efforts to preserve his proven record of placing the public’s safety, efficient government services, and quality of life issues at the top of his agenda. Supervisor Wehrheim has 40 years of government experience. He began employment with the Smithtown Department of Parks, Buildings and Grounds in 1972. He was appointed as director of the department in 1989 and remained department director until his retirement in 2003. During his tenure, Ed Wehrheim was proud to have Smithtown’s recreational facilities labeled as some of the finest facilities in the State of New York. Cut Expenses / Stabilized Taxes: Assisted supervisor Pat Vecchio in producing four consecutive minimal tax increase budgets. Substantial cost saving policies implemented to reduce town personnel budgets. Smith Haven Mall Redevelopment: Initiated negotiations with Simon Properties for development of Smith Haven Mall site generating additional tax revenues projected at $1.1 million per year. Smithtown Town Hall Elevator Addition: Supervised construction of ADA compliant elevator at Smithtown Town Hall. Ended 14 year deadlock on property development. Development of Neighborhood Park and village green by Town of Smithtown. Transfer of armory building site to Library District for construction of new library. Supported and supervised the reconstruction of the Town Marina Facility. Improvements paid for by marina fees. Continued efforts to control Town Departmental Budgets. Continued efforts to keep Smithtown fiscally stable. 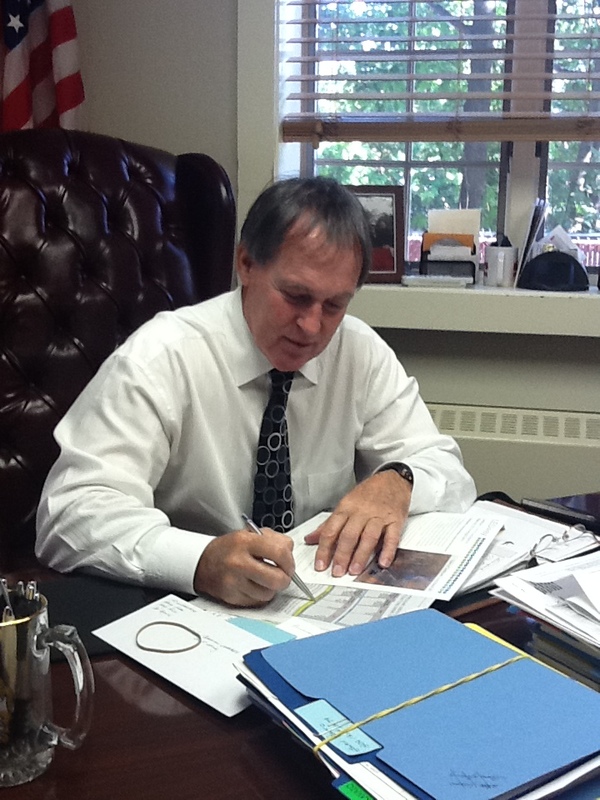 Continued efforts to stabilize town property taxes. Continues full time constituent service. Ed Wehrheim is a lifelong Smithtown resident born and raised in Kings Park. Ed and his wife, Diana, have two daughters, Kellie and Michelle. Supervisor Wehrheim is a graduate of Kings Park High School and a graduate of United State Navy Airframes / Structural Mechanic Service School-Millington, Tennessee. A veteran in the United States Navy, Supervisor Wehrheim was honorably discharged after two tours of duty in Vietnam 1968-1971. Supervisor Wehrheim is dedicated to the Smithtown Community as a Trustee of the Kings Park Education Foundation and a member of numerous local organizations including the Smithtown Sunrise Rotary, The Smithtown Historical Society and the Smithtown BPO Elks Lodge.